It's official, Ron Paul is at the top of the polls in Iowa. Newt Gingrich is falling faster than he can count. 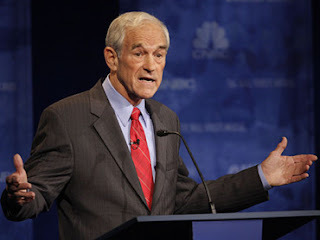 Mitt Romney is always in second, and Ron Paul is now the official frontrunner in Iowa with 23% support. there's a light at the end of the tunnel finally, America the Republic might show its face once more. would love to see ron paul go up against obama in a national debate. the american people's head would explode. Be Honest, who is your candidate? One thing is certain. It's going to be a weird day for the news. My hope is that the railing the conservative hacks are giving him now will just give more exposure and popularity to his ideas. Some guy was on the radio just saying that we need the troops in Germany and Japan because people are still afraid they're going to go radical again, that U.S. troops are a stabilizing force, and that Ron Paul is naive for not recognizing that. Meanwhile, the countries were are allegedly protecting against them are as fed up with U.S. influence in the region as anyone. Can you imagine, Japan up and appointing an emperor and invading China?